We’re back to the House of Yes for another fine evening of Mister Saturday Nighting, and we’re quite excited to be hosting a guest alongside Eamon and Justin for the first time since way back in September. That guest? A Detroit legend whose last time in New York was so long ago, we don’t remember it: DJ Rolando. According to “Mad” Mike Banks, co-founder of Detroit’s Underground Resistance label, he first came across DJ Rolando spinning Latin Freestyle music at a club in the D. Hearing his talent immediately, Mike asked him to join the UR team; and not too long after that, Rolando produced what would become one of the biggest cross-over techno tracks in history, “Knights of the Jaguar.” Soon after, he left UR to forge his own way from a new home-base in Edinburgh, where he’s kept his (astounding) DJ skills honed and produced records that have been released on Holland’s Delsin label and the Berghain-based label, Ostgut Ton. Not too shabby. What else? Well, there’s the 10,000 watts of Turbosound, the nice people and the cozy couches. And if you come by at 10, there’s an hour of beer on the house. 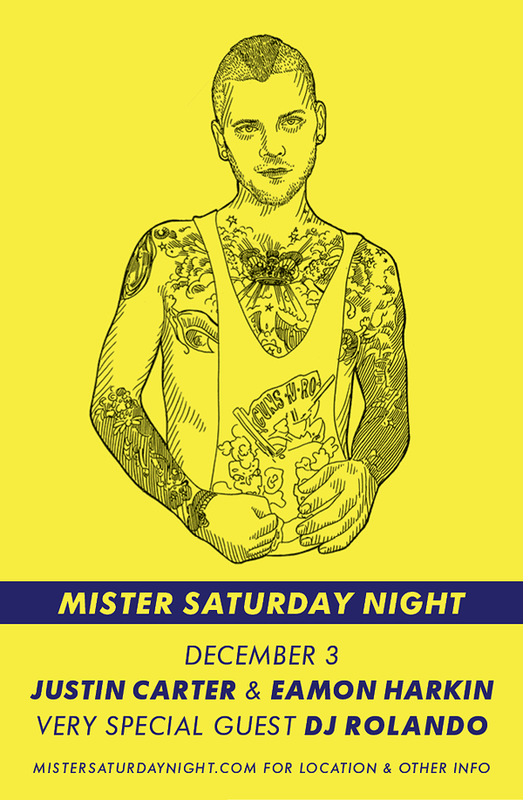 RSVP to mister@mistersaturdaynight.com to get in for $15 before midnight.